Martha's Vineyard (Wampanoag: Noepe; often simply called The Vineyard) is an island located south of Cape Cod in Massachusetts that is known for being an affluent summer colony. 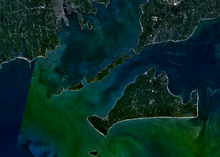 Martha's Vineyard includes the smaller Chappaquiddick Island, which is usually connected to the Vineyard, though storms and hurricanes have separated them, as in 2007. It is the 58th largest island in the United States, with a land area of about 96 square miles (250 km2), and the third-largest on the East Coast of the United States, after Long Island and Mount Desert Island. Martha's Vineyard constitutes the bulk of Dukes County, Massachusetts, which also includes the Elizabeth Islands and the island of Nomans Land. The Vineyard was home to one of the earliest known deaf communities in the United States; consequently, a special sign language, Martha's Vineyard Sign Language, was developed on the island. The 2010 census reported a year-round population of 16,535 residents, although the summer population can swell to more than 100,000 people. About 56 percent of the Vineyard's 14,621 homes are seasonally occupied. Martha's Vineyard is primarily known as a summer colony, and it is accessible only by boat and air. However, its year-round population has considerably increased since the 1960s. The island's year-round population increased about a third each decade from 1970 to 2000, for a total of 145 percent or about 3 percent to 4 percent per year (46 percent, 30 percent, and 29 percent in each respective decade). The population of the Vineyard was 14,901 in the 2000 Census and was estimated at 15,582 in 2004. (Dukes County was 14,987 in 2000 and 15,669 in 2004). Dukes County includes the six towns on Martha's Vineyard and Gosnold; it increased by more than 10 percent between 2000 and 2010, according to Census data released in 2011, gaining nearly 1,548 residents. The Island's population increased from 14,987 to 16,535. A study by the Martha's Vineyard Commission found that the cost of living on the island is 60 percent higher than the national average, and housing prices are 96 percent higher. A study of housing needs by the Commission found that the average weekly wage on Martha's Vineyard was "71 percent of the state average, the median home price was 54 percent above the state's and the median rent exceeded the state's by 17 percent". The island was also known as Martin's Vineyard (perhaps after the captain of Gosnold's ship, John Martin); many islanders up to the 18th century called it by this name. The United States Board on Geographic Names worked to standardize placename spellings in the late 19th century, including the dropping of apostrophes. 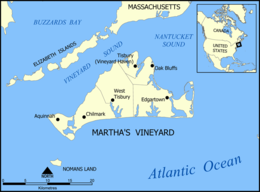 Thus for a time Martha's Vineyard was officially named Marthas Vineyard, but the Board reversed its decision in the early 20th century, making Martha's Vineyard one of the five placenames in the United States that takes a possessive apostrophe. The younger Mayhew began a relationship with Hiacoomes, a Native American neighbor, which eventually led to Hiacoomes' family converting to Christianity. Ultimately, many of the tribe became Christian, including the pow-wows (spiritual leaders) and sachems (political leaders). During King Philip's War later in the century, the Martha's Vineyard band did not join their tribal relatives in the uprising and remained armed, a testimony to the good relations cultivated by the Mayhews as the leaders of the English colony. In 1657, the younger Thomas Mayhew was drowned when a ship he was travelling in was lost at sea on a voyage to England. Mayhew's grandsons Matthew Mayhew (1648–), John Mayhew (1652–), and other members of his family assisted him in running his business and government. In 1665, Mayhew's lands were included in a grant to the Duke of York. In 1671, a settlement was arranged which allowed Mayhew to continue in his position while placing his territory under the jurisdiction of the Province of New York. In 1682, Matthew Mayhew succeeded his grandfather as Governor and Chief Magistrate, and occasionally preached to the Native Americans. He was also appointed judge of the Court of Common Pleas for Dukes county in 1697, and remained on the bench until 1700. He was judge of probate from 1696 to 1710. In 1683, Dukes County, New York was incorporated, including Martha's Vineyard. 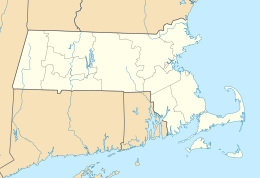 In 1691, at the collapse of rule by Sir Edmund Andros and the reorganization of Massachusetts as a royal colony, Dukes County was transferred back to the Province of Massachusetts Bay, and split into the county of Dukes County, Massachusetts and Nantucket County, Massachusetts. Native American literacy in the schools founded by Thomas Mayhew Jr. and taught by Peter Folger, the grandfather of Benjamin Franklin, was such that the first Native American graduates of Harvard were from Martha's Vineyard, including the son of Hiacoomes, Joel Hiacoomes. "The ship Joel Hiacoomes was sailing on, as he was returning to Boston from a trip home shortly before the graduation ceremonies, was found wrecked on the shores of Nantucket Island. Caleb Cheeshahteaumauk, the son of a sachem of Homes Hole, did graduate from Harvard in the class of 1665." Cheeshahteaumauk's Latin address to the corporation (New England Corporation), which begins "Honoratissimi benefactores" (most honored benefactors), has been preserved. In addition to speaking Wampanoag and English, they studied Hebrew, Greek, and Latin. All of the early Native American graduates died shortly after completing their course of study. Many native preachers on the island, however, also preached in the English churches from time to time. Mayhew's successor as leader of the community was the Hon. 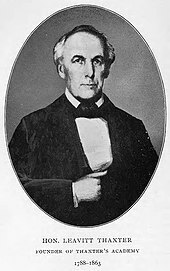 Leavitt Thaxter, who married Martha Mayhew, a descendant of Thomas Mayhew, and was an Edgartown educator described by Indian Commissioner John Milton Earle as "a long and steadfast friend to the Indians." 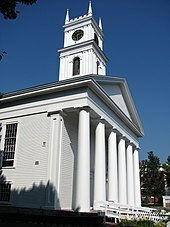 After living in Northampton, Thaxter, a lawyer, returned home to Edgartown, where he took over the school founded by his father, Rev. Joseph Thaxter, and served in the State House and the Senate, was a member of the Massachusetts Governor's Council and later served as U. S. Customs Collector for Martha's Vineyard. Having rechristened his father's Edgartown school Thaxter Academy, Hon. Leavitt Thaxter was granted on February 15, 1845, the sum of $50-per-year for "the support of William Johnson, an Indian of the Chappequiddic tribe." By this time, Leavitt Thaxter had taken on the role, described in an act passed by the General Court of Massachusetts, as "guardian of the Indians and people of color resident at Chappequiddic and Indiantown in the County of Dukes County." Thaxter Academy, founded by Leavitt Thaxter as first principal in 1825, became known for educating both white and Native American youth. The island received international notoriety after the "Chappaquiddick incident" of July 18, 1969, in which Mary Jo Kopechne was killed in a car driven off the Dike Bridge by U.S. Senator Edward "Ted" Kennedy. The bridge crossed Poucha Pond on Chappaquiddick Island (a smaller island formerly connected to the Vineyard and part of Edgartown). As a foot bridge, it was intended for people on foot and bicycles, as well as the occasional emergency vehicle when conditions warranted. Currently, 4×4 vehicles with passes are allowed to cross the reconstructed bridge. Since the 1990s, Bill Clinton spent regular vacation time on the island during and after his presidency, along with his wife, Hillary Clinton, and their daughter, Chelsea. Clinton was not the first president to visit the islands; Ulysses S. Grant visited the vacation residence of his friend, Bishop Gilbert Haven on August 24, 1874. As a coincidental footnote in history, Bishop Haven's gingerbread cottage was located in Oak Bluffs at 10 Clinton Avenue. 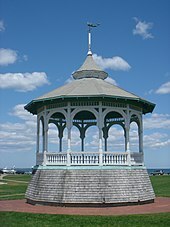 The avenue was named in 1851 and was designated as the main promenade of the Martha's Vineyard Campmeeting Association campgrounds. 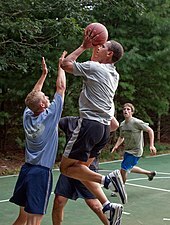 On August 23, 2009, Barack Obama arrived in Chilmark with his family for a week's vacation at a rental property known as Blue Heron Farm. In the summer of 2000, an outbreak of tularemia, also known as rabbit fever, resulted in one death and piqued the interest of the CDC, which wanted to test the island as a potential investigative ground for aerosolized Francisella tularensis. Over the following summers, Martha's Vineyard was identified as the only place in the world where documented cases of tularemia resulted from lawn mowing. The research could prove valuable in preventing bioterrorism. 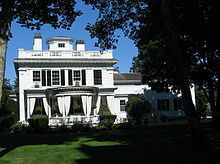 In the television show The X-Files, Fox Mulder's parents live on the island, and it was also the setting for Robert Harris' 2007 novel The Ghost. Martha's Vineyard was known as an "everyone signed" community for several hundred years, and many Deaf people view Martha's Vineyard as a utopia. A high rate of hereditary deafness was documented on Martha's Vineyard for almost two centuries. The island's deaf heritage cannot be traced to one common ancestor and is thought to have originated in the Weald, a region that overlaps the borders of the English counties of Kent and Sussex, prior to immigration. Researcher Nora Groce estimates that by the late 19th century, 1 in 155 people on the Vineyard was born deaf (0.7 percent), about 37 times the estimate for the nation at large (1 in 5,728, or 0.02 percent), because of a "recessive pattern" of genetic deafness, circulated through endogamous marriage patterns. Deaf Vineyarders generally earned an average or above-average income, proved by tax records, and they participated in church affairs with passion. The deafness on the island affected both females and males in an approximately same percentage. In the late 19th century, the mixed marriages between deaf and hearing spouses comprised 65 percent of all deaf marriages on the island, as compared to the rate of 20 percent deaf-hearing marriage in the mainland. The sign language used by Vineyarders is called Martha's Vineyard Sign Language (MVSL), and it is different from American Sign Language (ASL). However, the geographical, time, and population proximities state that MVSL and ASL are impossible to develop in complete isolation from each other. MVSL was commonly used by hearing residents as well as Deaf ones until the middle of the 20th century. No language barrier created a smooth communication environment for all the residences on the island. In the 20th century, tourism became a mainstay in the island economy, and new tourism-related jobs appeared. However, jobs in tourism were not as deaf-friendly as fishing and farming had been. Consequently, as intermarriage and further migration joined the people of Martha's Vineyard to the mainland, the island community more and more resembled the oral community there. The last deaf person born into the island's sign-language tradition, Katie West, died in 1952, but a few elderly residents were able to recall MVSL as recently as the 1980s when research into the language began. According to the Köppen climate classification system, the climate of the island borders between a humid continental climate (Dfa/Dfb), a humid subtropical climate (Cfa), and an oceanic climate (Cfb), the latter a climate type rarely found on the east coast of North America. Martha's Vineyard's climate is highly influenced by the surrounding Atlantic Ocean, which moderates temperatures throughout the year, albeit this moderation is nowhere as strong as on opposite sides of the Atlantic (Porto, Portugal) or the Pacific coast of the United States (Crescent City) at similar latitudes. Edgartown, which includes Chappaquiddick island and Katama. Edgartown is noted for its rich whaling tradition, and is the island's largest town by population and area. 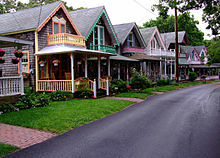 Oak Bluffs is most well known for its gingerbread cottages, open harbor, and its vibrant town along busy Circuit Avenue. Oak Bluffs enjoys a reputation as one of the more active night-life towns on the island for both residents and tourists. It was known as "Cottage City" from its separation from Edgartown in 1880 until its reincorporation as Oak Bluffs in 1907. Oak Bluffs includes several communities that have been popular destinations for affluent African Americans since the early 20th century. It also includes the East Chop peninsula, Lagoon Heights and Harthaven. The three "Down-Island" towns of Edgartown, Tisbury and Oak Bluffs are "wet" towns serving all alcohol. West Tisbury and Aquinnah are "soggy" towns that serve only beer and wine, and Chilmark is a "dry" town. Martha's Vineyard is located approximately seven miles off the southern coast of Cape Cod. It is reached by a ferry that departs from Woods Hole, Massachusetts, and by several other ferries departing from Falmouth, New Bedford, Hyannis, Quonset Point, Rhode Island, and the East 35th Street ferry terminal in Manhattan. The Steamship Authority operates most of the shorter routes, while Martha's Vineyard Fast Ferry and Hy-Line Cruises run faster, longer distance ferries to Rhode Island and Hyannis. There are direct ferries to each place. SeaStreak operates the seasonal, weekend New York City to Martha's Vineyard route. One ferry departs New York City on Friday afternoon and returns on Sunday night. The trip through Long Island Sound and along the shoreline of Rhode Island and Massachusetts takes about four and a half hours (270 minutes). In the era before modern highways and jet planes, travelers took New York, New Haven & Hartford Railroad trains from New York City or Boston to Woods Hole or Hyannis, at which point they would embark on ferries to the island. Commuter airline Cape Air offers frequent service to the island via the Martha's Vineyard Airport (MVY). It provides year-round service to and from Boston, Hyannis, New Bedford, Providence, and Nantucket, and seasonal service to White Plains, New York. Additional air service is provided to New York-LaGuardia, as well as Philadelphia and Washington-Reagan seasonally. JetBlue serves the island out of New York's Kennedy Airport. Delta Connection also operates seasonal service to New York-LaGuardia and New York-JFK airports, and American Airlines operates seasonal service to Washington-Reagan. The airport also handles much general aviation traffic. Katama airpark, with grass runways, is popular with private pilots; it is located near South Beach. Five of the six towns have their own elementary schools, while Aquinnah residents usually attend nearby Chilmark's elementary school. The Chilmark school serves only grades pre-K to 5, so students in grades 6–8 must attend another middle school—usually the West Tisbury school. The Martha’s Vineyard Public Charter School, located in West Tisbury, serves the entire island and provides grades K–12. Martha's Vineyard Regional High School, which is located in Oak Bluffs, serves the entire island. The Vineyard grew as a tourist destination primarily because of its very pleasant summer weather (during summers, the temperature rarely breaks 32 °C / 90 °F) and many beautiful beaches. It is primarily a place where people go to relax and the island offers a range of tourist accommodation including large hotels such as the Harbor View Hotel and Winnetu Resort, modern boutique hotels like the Nobnocket Boutique Inn as well as traditional bed and breakfasts such as The 1720 House, Ashley Inn, Pequot House, Thorncroft Inn and Oak Bluffs Inn. Many visitors also rent private homes. Other popular attractions include the annual Grand Illumination in Oak Bluffs; the Martha's Vineyard Film Center, an arthouse cinema which the non-profit Martha's Vineyard Film Society, and which screens independent and world cinema all year long; the historic Capawock and Strand theatres, also run by the Martha's Vineyard Film Society, the Martha's Vineyard Film Festival, which runs a winter film festival in March, a Summer Film Series and Cinema Circus every Wednesday in July and August, the Martha's Vineyard African-American Film Festival, which showcases the works of independent and established African-American filmmakers in August, and Martha's Vineyard International Film Festival in September; the Farm Institute at Katama Farm in Edgartown; and the Flying Horses Carousel in Oak Bluffs, the oldest operating platform carousel in the United States. Its relatively small year-round population has led to a very activist citizenry who are highly involved in the island's day-to-day activities. Tourism, over-development, politics, and environmentalism are of keen interest to the community. Keeping the balance between the much needed tourist economy and the ecology and wildlife of the island is of paramount importance to residents. In contrast to the seasonal influx of wealthy visitors, Dukes County remains one of the poorest in the state. Residents have established resources to balance the contradictions and stresses that can arise in these circumstances, notably the Martha's Vineyard Commission and Martha's Vineyard Community Services, founded by the late Dr. Milton Mazer, author of People and Predicaments: Of Life and Distress on Martha's Vineyard. Martha's Vineyard has also been or is home to a number of artists and musicians, including Albert Alcalay, Evan Dando, Tim "Johnny Vegas" Burton of the Mighty Mighty Bosstones, James Taylor, Carly Simon, Livingston Taylor, Kate Taylor, Alex Taylor, Tom Rush, Geoff Muldaur, Maria Muldaur, Willy Mason, Unbusted and Mike Nichols. Historian and author David McCullough is also an island resident, as is author Susan Branch and the young-adult books authors: Judy Blume and Norman Bridwell, and crime/political intrigue novelist Richard North Patterson. Late authors Shel Silverstein and William Styron also lived on the Vineyard, as did writer, journalist and teacher John Hersey, poet and novelist Dorothy West and artist Thomas Hart Benton. Various writers have been inspired by the island—including the mystery writer Philip R. Craig who set several novels on the island. On related note, Martha's Vineyard Poet Laureate, Lee H. McCormack, has written many poems about the island. The Academy Award-winning Patricia Neal owned a home on South Water St in Edgartown, and James Cagney, Lillian Hellman (who is buried in Abel's Hill Cemetery near the site of Belushi's grave), and Katharine Cornell all found the Vineyard an exciting, rewarding place to live. In addition the famous Life Magazine photographer Alfred Eisenstaedt was a fifty-year summer resident of the Vineyard until his death in 1995. Since 2006 the Australian born author Geraldine Brooks, writer of the Pulitzer Prize winning novel March, has lived there with her husband, Tony Horwitz, himself a Pulitzer Prize winner and successful novelist, and their two sons. Other well-known celebrities who live on or have regularly visited the island: Famously renowned Harlem Renaissance artist Lois Mailou Jones, former U.S. President Barack Obama, former president Bill Clinton and his wife, former Secretary of State Hillary Clinton; comedian and talk show host David Letterman; Bill Murray; Tony Shalhoub; Quincy Jones; Ted Danson and wife Mary Steenburgen; Larry David; the Farrelly brothers; Meg Ryan; Chelsea Handler. 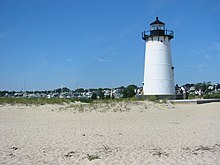 Mike Wallace of 60 Minutes was a summer resident of Martha's Vineyard. Late anchorman Walter Cronkite was a prominent summer resident as well. Other regularly appearing celebrities include film writer/director Spike Lee, attorney Alan Dershowitz, comedians Dan Aykroyd and James Belushi, politico Vernon Jordan, television news reporters Diane Sawyer, fashion designer Kenneth Cole (designer) and former Ambassador and President of the Metropolitan Museum of Art, William H. Luers and Charlayne Hunter-Gault. Despite popular perceptions of the Vineyard as "Hollywood East", the island is very low-key and quiet; celebrities go to the Vineyard to enjoy the atmosphere, and not to be seen. Locals tend to be protective of celebrity privacy, though recent coverage of celebrity sightings (most notably in the two local newspapers on the Island) has begun to erode that respect for privacy through more frequent reporting on celebrity sightings and famous visitors. In August 2014, both President Obama and Hillary Clinton planned to have overlapping visits to the island, where the presence of security details that create traffic challenges is becoming an annual affair. Vineyard social life often occurs in private, down country roads, and not in the small towns, and until 2017 only two of which sold alcohol (Oak Bluffs and Edgartown). In the same month an article titled "Edgartown's Darker Side" appeared in the Boston Globe detailing the extremely poor working conditions suffered by Irish and Serbian students in a newly built private members club in Edgartown. Concerns over munitions that may be buried on Martha's Vineyard, most from World War II, have led to an 8.1 million dollar project to remove and rebuild part of a privately-owned barrier beach off the Tisbury Great Pond. The year-round working population of Martha's Vineyard earns 30 percent less on average than other residents of the state while keeping up with a cost of living that is 60 percent higher than average. Many people are moving to more affordable areas. Schools have seen a successive drop in enrollment over the past few years. Typically home to artists, musicians, and other creative types, the Island has many residents who manage by working several jobs in the summer and taking some time off in the winter. The lack of affordable housing on the island has forced many families to move off-island. WVVY-LP – 96.7 FM, Martha's Vineyard Community Radio, Inc.
^ Gosnold's daughter was christened in St. James' Church (now St. Edmundsbury Cathedral), Bury St. Edmunds in Suffolk, England and is buried in the Great Churchyard that lies in front of the Abbey ruins between St. Mary's Church and the Cathedral. ^ "Martha's Vineyard". Capecodchamber.org. June 27, 2015. ^ "Spring Gale Roars Through Island, Norton Point Is Breached". Retrieved April 3, 2015. ^ "Land Meets Land; Norton Point Breach Closes". Retrieved April 3, 2015. ^ "How large is Martha's Vineyard?". Retrieved April 9, 2019. ^ Groce, Nora Ellen (2009). Everyone Here Spoke Sign Language. Harvard University Press. ISBN 978-0674037953. Retrieved August 12, 2015. ^ a b State House News Service (March 23, 2011). "Martha's Vineyard population grew in last decade, Census shows". Martha's Vineyard Times. Retrieved January 18, 2015. ^ a b "Population and Housing Profile of Martha's Vineyard" (PDF). Mvcommission.org. Archived from the original (PDF) on March 6, 2012. Retrieved January 18, 2015. ^ "Cost of Living Found Shockingly High Here". The Vineyard Gazette – Martha's Vineyard News. Retrieved January 18, 2015. ^ "Highlights of the Martha's Vineyard Housing Needs Assessment" (PDF). Martha's Vineyard Commission. May 6, 2014. Retrieved July 20, 2016. ^ Zinn, Howard (February 4, 2003). A People's History of the United States. ISBN 9780060528423. Retrieved January 18, 2015. ^ Stewart, George (1945). Names on the Land: A Historical Account of Place-Naming in the United States. New York: Random House. pp. 26–27. ^ "Unique signature found by town researcher". Buryfreepress.co.uk. Archived from the original on April 16, 2008. Retrieved January 18, 2015. ^ Calloway, Colin Gordon (1997). After King Philip's War. ISBN 9780874518191. Retrieved January 18, 2015. ^ The Massachusetts Register and United States Calendar for the Year of Our . 1847. Retrieved January 18, 2015. ^ Sprague, William Buell (1865). Annals of the American Unitarian Pulpit. Retrieved January 18, 2015. ^ Kellogg, Allyn Stanley (1860). Memorials of Elder John White, One of the First Settlers of Hartford, Conn . Retrieved January 18, 2015. ^ "Reed Digital Collections : Item Viewer". Cdm.reed.edu. Retrieved January 18, 2015. ^ Acts and Resolves Passed by the General Court. 1845. Retrieved January 18, 2015. ^ "The History of Martha's Vineyard by Henry Franklin Norton, 1923". History.vineyard.net. Retrieved January 18, 2015. ^ Hough, Henry Beetle (1966). Martha's Vineyard, Summer Resort After 100 Years. Retrieved January 18, 2015. ^ Shukla, Arvind N.; Rajiv Tyagi (2001). Encyclopaedia of Birds. Anmol Publications. p. 52. ISBN 81-261-0967-X. ^ "Nonstandard verb forms in the dialect of Tristan Da Cunha". Let.leidenuniv.nl. Retrieved January 18, 2015. ^ eht5y (June 20, 1975). "Jaws (1975)". IMDb. Retrieved January 18, 2015. ^ Seccombe, Mike (2007). "Talkin' About a Revolution". Martha's Vineyard Magazine. pp. September–October issue. Archived from the original on July 14, 2011. Retrieved September 10, 2009. ^ "Top 10 Celebrity Grave Sites". Time. September 3, 2009. ^ a b Seccombe, Mike (August 25, 2009). "President Obama and Family Arrive". Vineyard Gazette. Retrieved September 9, 2009. ^ "Tularemia on Martha's Vineyard: Seroprevalence and Occupational Risk". Emerging Infectious Diseases. 9 (3). March 2003. Retrieved April 23, 2012. ^ a b Maslin, Janet (October 25, 2007). "The Ghost – Robert Harris – Books – Review". The New York Times. ISSN 0362-4331. Retrieved January 26, 2018. ^ a b c Groce, Nora Ellen (1985). Everyone Here Spoke Sign Language: Hereditary Deafness on Martha's Vineyard. Cambridge, MA: Harvard University Press. ISBN 978-0-674-27041-1. Retrieved October 21, 2010. ^ Russell, Cormac (August 14, 2014). "Fantasy Island: Is disability just a construct?". Nurture Development. Retrieved August 4, 2017. ^ Sacks, Oliver (1989). Seeing Voices: A Journey into the World of the Deaf. Berkeley and Los Angeles, California: University of California Press. ISBN 978-0-520-06083-8. Retrieved October 21, 2010. ^ a b c d e "General Climate Summary Tables". Western Regional Climate Center. Retrieved February 22, 2013. ^ Vineyard Transit. "The Official Site of Vineyard Transit". Vineyardtransit.com. Retrieved January 18, 2015. ^ "The Edgartown School on Martha's Vineyard – a nationally-recognized blue ribbon school of excellence". Edgartownschool.org. Retrieved January 18, 2015. ^ "MVPCS Home". Mvpcs.org. Retrieved January 18, 2015. ^ "Martha's Vineyard Regional High School". Retrieved January 18, 2015. ^ "Chilmark, Massachusetts". City-data.com. Retrieved January 18, 2015. ^ "Welcome to Martha's Vineyard Regional High School". MVRHS. Retrieved January 26, 2018. ^ "News in Brief : The Martha's Vineyard Times". Mvtimes.com. August 14, 2008. Archived from the original on February 25, 2012. Retrieved April 23, 2012. ^ "Martha's Vineyard Film Center". Mvfilmsociety.com. Retrieved January 18, 2015. ^ "The Martha's Vineyard Film Festival". Retrieved January 18, 2015. ^ "Martha's Vineyard African-American Film Festival". Mvaaff.com. Retrieved January 18, 2015. ^ "The Farm Institute". Farminstitute.org. Retrieved January 18, 2015. ^ "Martha's Vineyard Commission – Dukes County, Marthas Vineyard Massachusetts Regional Planning". Mvcommission.org. Retrieved January 18, 2015. ^ "Martha's Vineyard Community Services". Mvcommunityservices.com. Retrieved January 18, 2015. ^ Milton Mazer, M.D. People and Predicaments: Of Life and Distress on Martha's Vineyard. Published by Harvard University Press (1976), Cambridge, Massachusetts. ^ Brooks, Geraldine (2005). March. London: Fourth Estate. p. 280. ISBN 978-0-00-716586-5. ^ Roosevelt, Laura D. "Writers in Residence". Martha's Vineyard Magazine. The Vineyard Gazette. Retrieved February 25, 2019. ^ Taylor, Richard L. (2016). Martha's Vineyard: Race, property, and the power of place. pp. 265–274. ISBN 9780997670400. ^ Williamson, Elizabeth (August 29, 2009). "Newspaper War Disturbs the Peace In a Summer Haven". The Wall Street Journal. Archived from the original on May 10, 2013. ^ Zezima, Katie. "Is Martha's Vineyard big enough for both Barack Obama and Hillary Clinton?". The Washington Post. Retrieved August 11, 2014. ^ Jefferson, Alison Rose. "Inkwell, Martha's Vineyard (1890s– )". BlackPast.org. Retrieved February 3, 2017. ^ "Obama island's Brazilian 'engine'". BBC News. August 23, 2009. ^ Leonard, Tom (August 28, 2009). "The dark side of Martha's Vineyard". Daily Telegraph. London. Retrieved September 12, 2009. ^ MacQuarrie, Brian (December 10, 2010). "Along pristine beaches, hidden dangers linger". Boston.com. Retrieved November 21, 2018. ^ "Bomb Removal Begins at Long Point". The Vineyard Gazette - Martha's Vineyard News. Retrieved November 21, 2018. ^ "Community Reinvestment Act Performance Evaluation" (PDF). December 9, 2008. p. 3. Retrieved August 21, 2015. Gookin, Historical Collections, 53; Railton, "Vineyard's First Harvard men", 91–112.